An artistic rendering of the Jupiter-like exoplanet, 51 Eri b, seen in the near-infrared light that shows the hot layers deep in its atmosphere glowing through clouds. Because of its young age, this young cousin of our own Jupiter is still hot and carries information about the way it was formed 20 million years ago. Mounted on the 8-meter Gemini South Telescope in Chile, the Imager began searching for giant planets circling 600 young stars in November 2014. In December, 51 Eridani b turned up around a star approximately 100 light years away. The newfound world orbits its parent star at a distance a bit farther than that of Saturn around our sun. Overall, the planet and its star are just 20 million years young — spring chickens compared to our 4.6-billion-year-old Solar System. Because of its youth, 51 Eridani b smolders at 800 degrees Fahrenheit (427 degrees Celsius), but it is still more than three million times less luminous than its stellar host. The Imager was specifically designed to spot fledging exoplanets by separating their faint light from the overwhelming glare of their host stars, thus offering a revealing look back into the early, murky eras of planetary formation. B.M. : There's always a brief phase of "What did we do wrong?" and "It can't be real!" After that passed, the discovery was pretty exciting because it's really exactly what the Gemini Planet Imager was made to do. We had seen our first relatively cold, low-mass planet. B.M. : The astronomical instruments that have successfully imaged several planets to date weren't really built for the task. They were general purpose cameras made to look at galaxies. No one thought they would actually be used to study exoplanets! The Gemini Planet Imager was built from the ground up just to detect extrasolar planets. It has special masks to block light from parent stars that would otherwise overwhelm their comparatively dim planets. It has a powerful "adaptive optics" system that can reduce the image-blurring effects from atmospheric turbulence better than its predecessors. And it has mirrors that were super-polished in a big, clean enclosure so they don't have dust specks on them that could be mistaken for planets. B.M. : The top-level goal is to understand the processes that form planets. Astronomers have a problem because many of the exoplanets discoveries have overturned the old theories of planet formation. The old theories were really good at explaining how our Solar System was made, and that's what we thought others would look like. But now we know our Solar System isn't even remotely typical. B.M. : 51 Eridani b is much dimmer and cooler than the other young, glowing planets we've seen. Its atmosphere has really changed from an almost star-like state dominated by huge, glowing clouds of liquid metal or dust. 51 Eridani b has gotten cold enough that a huge amount of methane has formed in its atmosphere, which can't occur in a star's atmosphere. Methane is what we expected to see in planets because Jupiter is full of it. B.M. : The "hot start" process is great at forming giant planets, but it's terrible at forming Earths. The "cold start" process, on the other hand, is pretty good at forming planets over a broad range of masses, from giants such as Jupiter, which has more than 300 times Earth's mass, on down to Earth-sized worlds. Yet the problem with the cold start models that we think formed Jupiter is that they operate only over a fairly narrow range of places within a solar system. They can't operate very close to a star or very far away from a star — both of which are places where we know there are lots of exoplanets. The discovery of those worlds is what prompted people to come up with hot start formation models in the first place. These models however, have not been confirmed observationally. There's really no evidence for them so far. With 51 Eridani b, it will be really nice to confirm which model it is consistent with. TKF: How will you figure out 51 Eridani b's origin? B.M. : Next, we want to measure 51 Eridani b's orbit and take more detailed spectra to reveal its atmospheric chemistry. We really want to know the ratio of the heavier elements, carbon or oxygen, to the lightest, commonest element, hydrogen, in 51 Eridani b's atmosphere. Because Jupiter formed partially out of solid material, it has extra carbon and oxygen compared to the Sun. That same process — building-up from solid material — is how we think the Earth formed. If we see that 51 Eridani b is enhanced in carbon and oxygen, then we would know it formed the way that the Earth or Jupiter did. B.M. : The planet is always going to be more massive than Jupiter, but it will definitely cool down to Jupiter-like temperatures in a few hundred million more years. 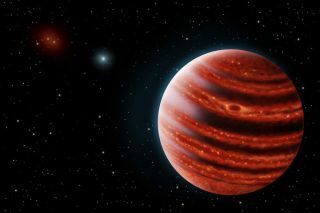 51 Eridani b is a little bit farther from its star that Jupiter is from the Sun, and it's unlikely that it would ever migrate inward to a more Jupiter-like distance. That said, it's certainly true that this solar system has the 'room' for an Earth. It's one of a handful of solar systems that could resemble ours and with future observations, someday we should know the answer.